Up to $28 million is up for grabs for floating offshore wind projects using a control co-design principle, with a new round of grants from the country's Department of Energy (DOE). The funding forms part of the Advanced Research Projects Agency-Energy (ARPA-E) programme. The ATLANTIS projects – a typical US acronym standing for Aerodynamic Turbines Lighter and Afloat with Nautical Technologies and Integrated Servo-control – will "require design approaches that maximise power-to-weight ratios while maintaining or increasing turbine efficiency", the DOE said. Co-design methodologies means several engineering disciplines can work "concurrently while designing a device, instead of sequential steps", the DOE added. The US offshore wind industry has sparked into life over the past two years, most recently in the federal auction in Massachusetts in December. Floating offshore wind is following closely behind, with several projects under consideration already. German utility-developer EnBW marked its entrance in to the US in June 2018, forming a joint venture with Trident Winds to develop a 1GW floating wind site off California. A consortium comprising floating platform designer Principle Power, developer EDPR, engineering firm Aker Solutions, ecological consultancy HT Harvey and Associates, and the Herrera Environmental Consultants, submitted a lease application to the US Bureau of Ocean Energy Management (BOEM) in September for 100-150MW floating array, also off California. 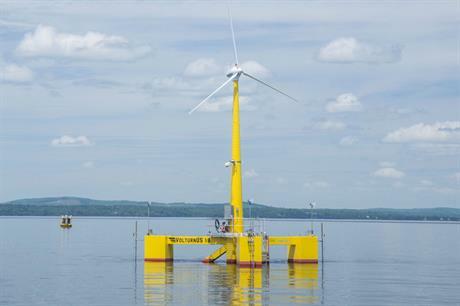 Meanwhile, the University of Maine designed and has been testing a floating wind platform concept for several years. And Hawaii has been identified as a potential hotspot for floating wind deployment.